One Friday night in March 2008, spectators at a college basketball game in Atlanta noticed the scoreboard inside the huge Georgia Dome stadium beginning to sway. Outside, a tornado was whipping through the city, its 135 mph (217 kph) winds laying waste to much of downtown. But the Georgia Dome made it through the maelstrom relatively intact, and none of the thousands of basketball fans inside were hurt. The stadium's roof held, suffering only minor damage — seemingly a surprise, since the roof is made of fabric. But it's no ordinary fabric. It's a special type of lightweight, ultrastrong material originally developed for NASA spacesuits. Today's fabric roofs have their roots in the 1967 Apollo I fire, when three NASA astronauts died during a launch pad test of the Apollo/Saturn space vehicle. This tragedy motivated NASA to redesign the Apollo module and look for ways to make its spacesuits tougher and more fire-resistant, NASA officials have said. As a result, two companies — Owens-Corning Fiberglass and DuPont — came up with a fabric known as "Beta cloth." Beta cloth consisted of ultrafine glass filaments woven into a fabric, then coated with a substance called polytetrafluoroethylene (PTFE, more commonly known as Teflon). The material turned out to suit NASA's needs; it was durable and practically non-combustible, with a melting point above 650 degrees Fahrenheit (343 degrees Celsius). 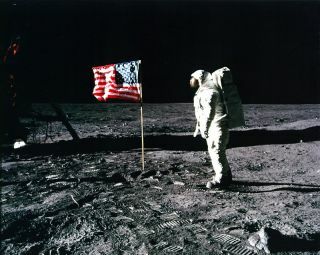 NASA incorporated the new fabric into the A7L space suit worn for the Apollo moon missions and the Skylab program. The space agency has since moved on — its current suits use Ortho-Fabric, which is a blend of Gore-Tex, Kevlar and a material called Nomex — but Beta cloth found a long life in another application: fabric roofing. A firm called Birdair Structures, Inc., eventually caught wind of the strong, lightweight new fabric material. Birdair had extensive experience designing and installing fabric structures, and it teamed with Owens-Corning, DuPont and the Chemical Fabrics Corporation to devise and use a modified version of Beta cloth. In 1973, Birdair engineered and built the world's first permanent roof system based on PTFE fiberglass technology — a sports complex at a university in La Verne, Calif. Many other structures followed, including the Millenium Dome in London, the Jeppesen Terminal at Denver International Airport and the Cowboys Stadium in Dallas. Birdair has installed more than 30 million square feet (2.8 million square meters) of fabric roofing over the years, company officials have estimated. The material has caught on so well because it's strong and light, weighing less than 5 ounces per square foot, according to NASA officials. The fabric roofs also cost 30 to 40 percent less than conventional roofs. And the roofs are energy-efficient, letting in natural light while keeping out heat. So sports fans in stadiums around the world — and travelers trudging through airport terminals — can look up and feel a slight connection with the men who walked on the moon four decades ago.